A girl has shared a shocking video showing a boy’s awful reaction when she refused to give him her phone number. Lorin Cantrell from Tennessee shared the camera footage on Twitter last week, showing a boy’s completely unnecessary and violent reaction to her simply not wanting to give him her number. Not only does he smash up her car, he drags her away from it when she gets out to confront him over his actions. This sh*t really happens in this world. wouldn’t give him my phone number and this was the result. stay safe guys. people are f**ked up. [sic]. Presumably taken from CCTV footage, the video shows a passenger getting into a car. A guy is then seen to walk over to the driver’s window where he remains for a couple of seconds before coming back to the front of the car. 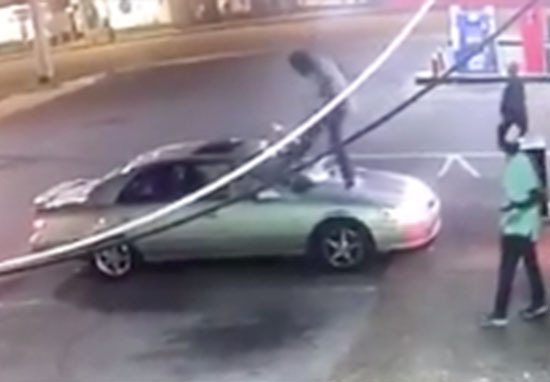 Suddenly, he jumps onto the bonnet of the car, before violently jumping up and down, crushing the metal, before slamming his foot down hard into the windshield a couple of times. 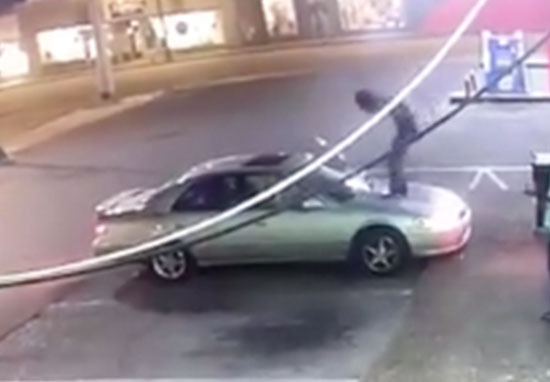 The windshield is completely shattered, and the the driver quickly reverses out, leaving the man stumbling off the car. 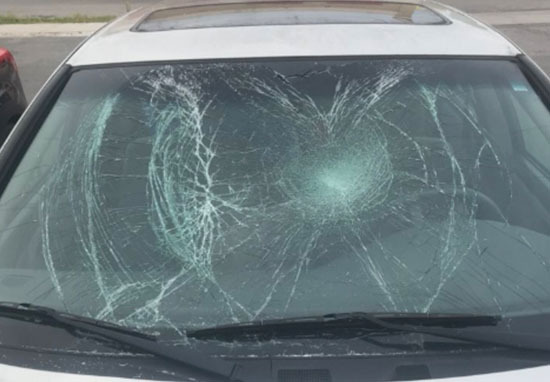 Lorin struggled to drive the car any further due to the damaged windshield. She explained that she actually had glass in her eye which prevented her from seeing where she was going. I reversed really hard to knock him off but it didn’t work & I couldn’t see anything out of my windshield and there was glass in my eye, there’s not a good explanation as to why I got out, I don’t even know just my first reaction. [sic]. In the video, you can see the boy then approaching the passenger side of the car and kicking it again. Lorin then gets out of the driver’s seat and the boy walks towards her, grabbing her aggressively and pushing her down onto the floor out of sight. Throughout the whole situation, two other men stood at the scene, doing nothing to stop the boy from vandalising the car or acting violently towards the innocent girl. Later people gathered around the car, hopefully after having stopped the boy from hurting Lorin or doing anything else aggressive. The young woman told her followers she had received bruises from the horrible events, but was otherwise okay. The shocking video has been shared over 11,000 times on Twitter, with many people commenting on the boy’s rash and ridiculous behaviour. Men are always so quick to be aggressive when they feel their masculinity is being diminished. I’m so sorry this happened and I’m glad you are ok.
Men are always so quick to be aggressive when they feel their masculinity is being diminished. I'm so sorry this happened and I'm glad you are ok. The boy’s reaction was totally uncalled for and aggressive, and he no doubt terrified Lorin as well as causing extensive damage to the car – all because she wouldn’t give him her phone number. Unbelievable. He needs to learn to take no for an answer.